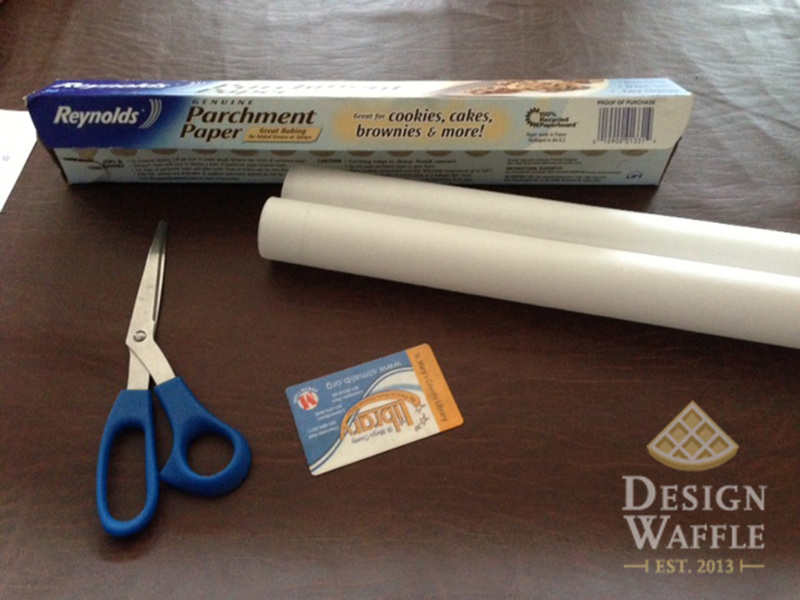 The sign we made was 13″ x 32″ so the supplies below reflect those dimensions. 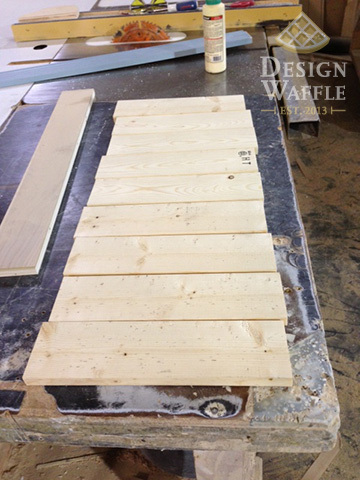 We started by cutting the wood into 13″ lengths. 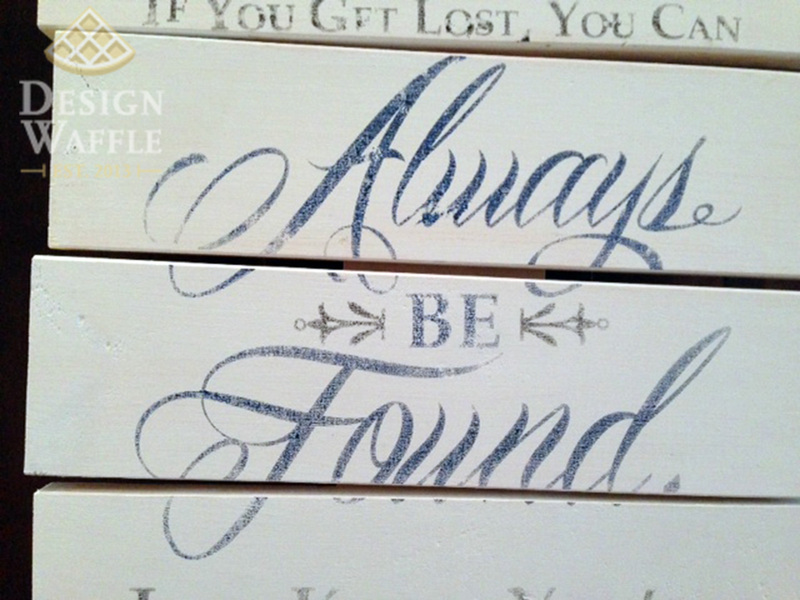 I knew I was after a distressed look so we positioned them in an uneven fashion with gaps and all. 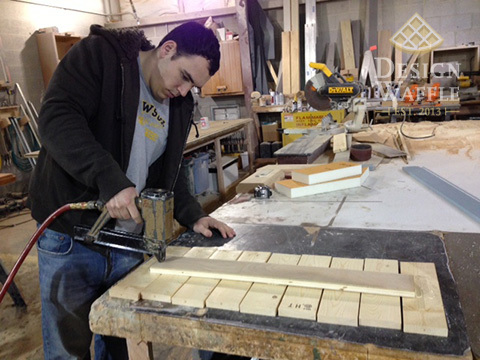 Travis then cut a piece of wood for the back of the sign to hold together all of the horizontal pieces. 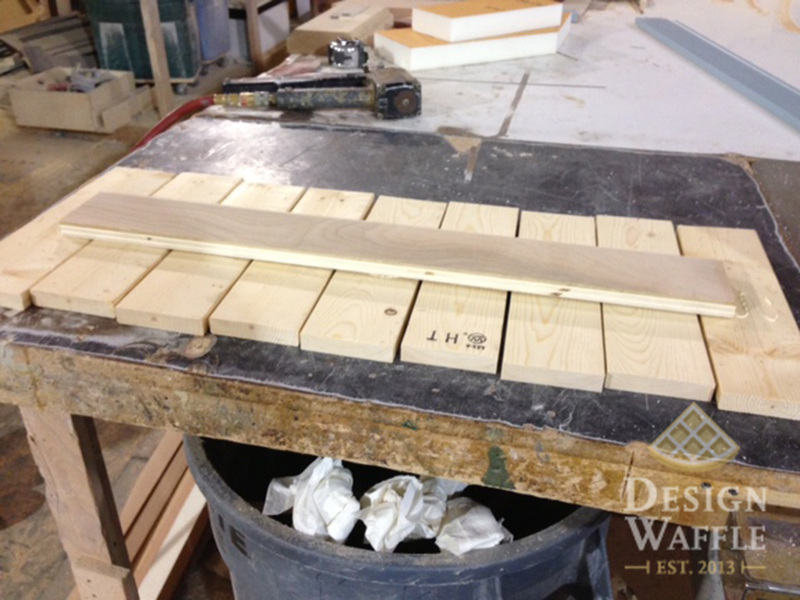 Then we applied the wood glue and stapled everything in place. And when I say “we” for all of the sign building steps, I really mean Travis did all of this and I pretended to help. You’re probably wondering where those screws came from, right? Well, I got impatient and decided I didn’t want to wait for the wood glue to dry so we added the screws so we could move on with the project. In the end, the staples ended up being unnecessary. Oh well. While Travis painted the sign white, I designed the layout on my computer. I started with the design in Adobe Illustrator and then moved it into InDesign where I broke it up into small, printable pages. 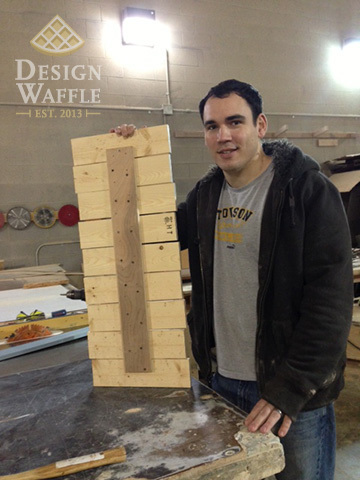 Since our sign is 13″ wide, I designed the pages on legal sized paper. 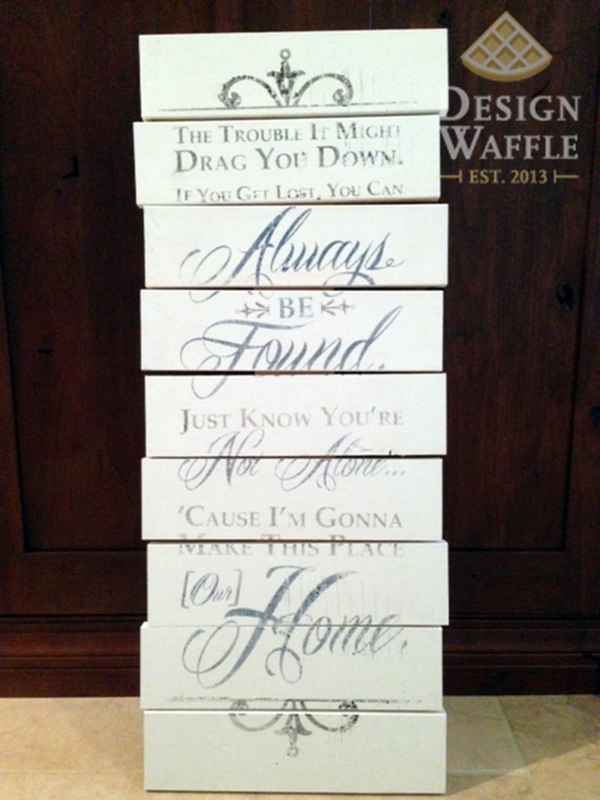 I chose a few lyrics from Phillip Phillips’ song “Home” because it felt fitting for my sister and her husband. Life has been far from perfect, especially these past few months and buying their first home has been awfully bittersweet for them. I hope when they see this sign every day, that they’re reminded how strong they are and that we’re all here for them. 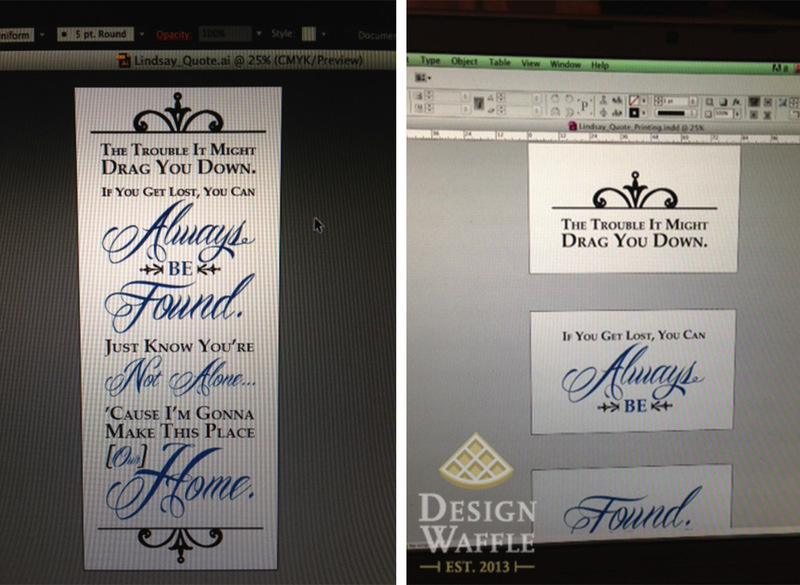 Now that the design was final, I was ready for transferring the image to the sign. 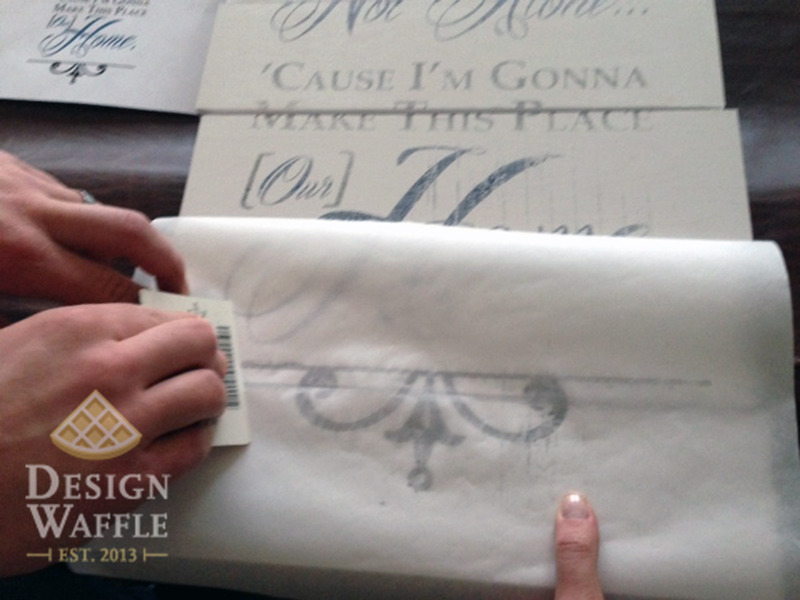 ***Make sure you reverse your design! Otherwise it will be backwards on your sign. I gathered the parchment paper, scissors, an old library card for rubbing the image and turned on the printer. Since my design was separated into legal sized pages, I trimmed the parchment paper into 8.5″ x 14″ pieces. I hand fed the parchment paper into the printer. 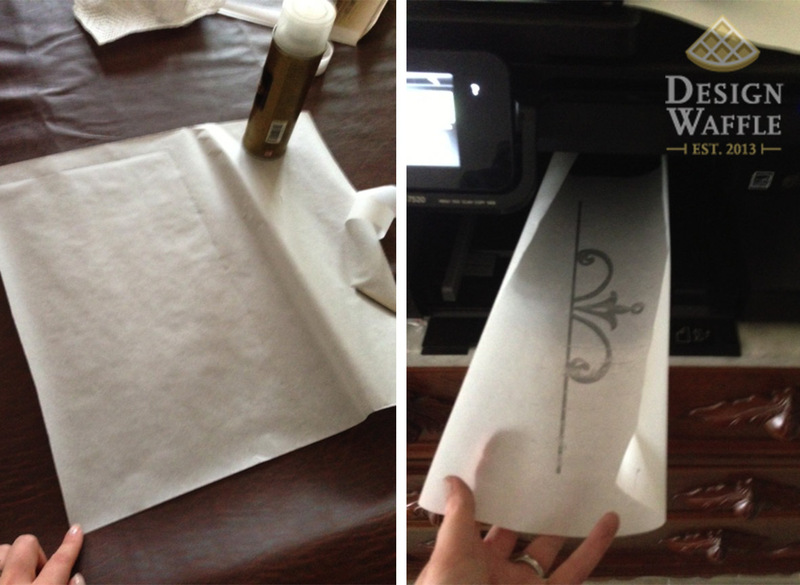 This was a little scary because the parchment paper made all sorts of funny sounds but it actually printed on it. I printed one page at a time so that the ink didn’t have any time to dry. We immediately flipped the image over, ink side down, and used the library card to rub the image onto the wood. 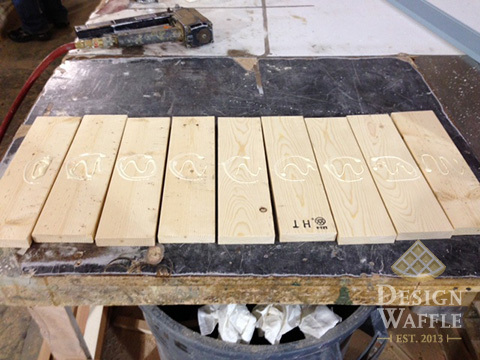 Since we were transferring onto a painted surface, you can see how the print ended up. Had we transferred the ink onto raw wood, it would have been darker and less smeary. 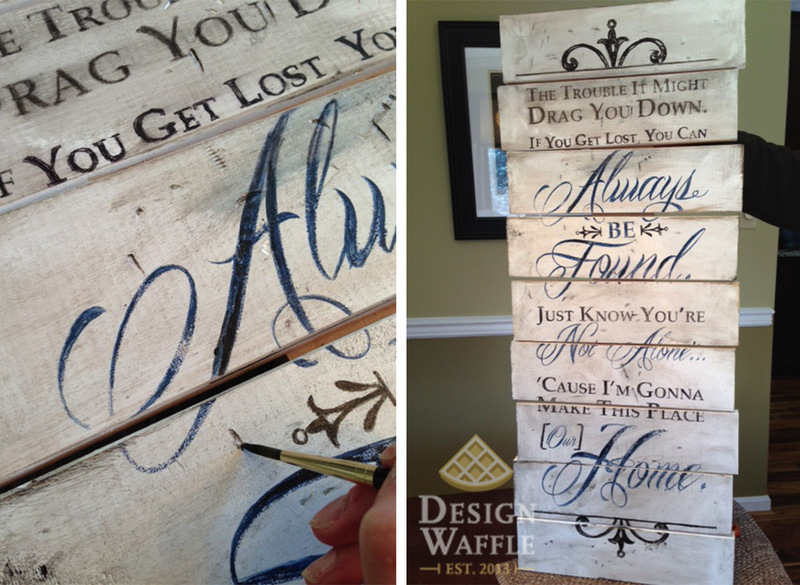 I was after a specific look, so I used acrylic paints to fill in the lettering to darken it up. I didn’t paint it perfectly because I wanted it to look old. Once the painting was finished, I was ready for the distressing. I placed a screw in different places on the sign and used the hammer to hit it, leaving the impressions in the wood. I used whatever we had laying around (old sandpaper, a door hinge, a wrench and a screw) to make marks in the wood. In my opinion, the hinge made the best marks. Then I sanded random edges and corners to wear down the sign. After I was done beating up the sign, I applied glaze all over with an old t-shirt and then wiped it off immediately. The glaze sunk into all the distress marks and where I sanded leaving the sign looking antiqued and old. Some of the distress marks didn’t hold the glaze so I faked it with a little black paint. After the glaze dried, I quickly sprayed the entire sign with a clear coat to lock in the glaze. 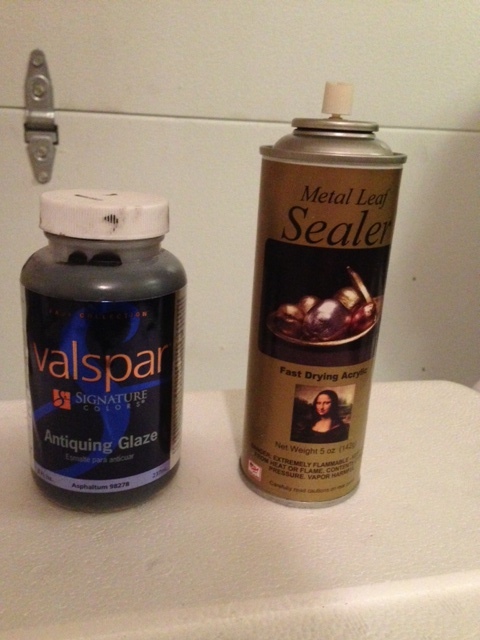 I used gold leaf sealer since it was on hand. 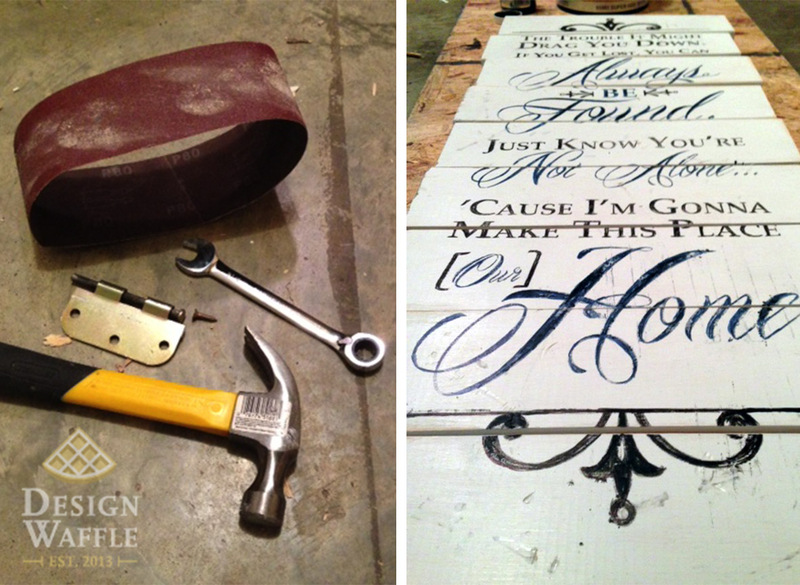 I nailed a sawtooth picture hanging hook to the back of the sign and called it done… for now. I was thinking about adding a few wooden knobs to the bottom so they can hang their keys since this will be hung by their front door. 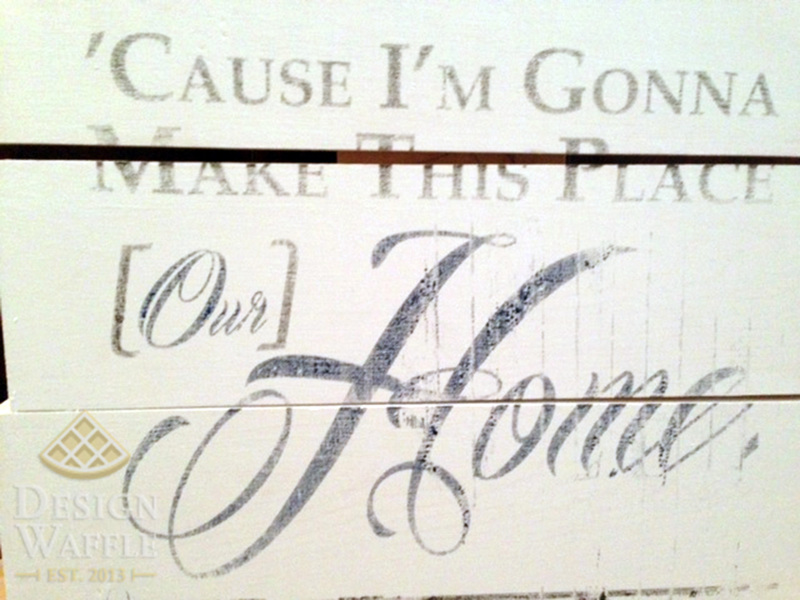 This was our first time transferring a printed image to wood. I found it to be surprisingly easy and quick too. I’ll definitely be doing this again in the future. I hope you’ll give it a try and if you do, please share your results! 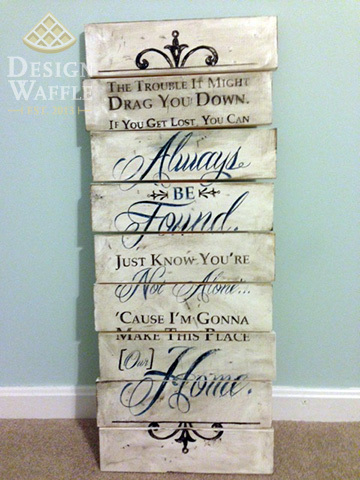 This entry was posted in DIY Projects and tagged DIY, inspiration, quote, transfer inkjet image to wood, wooden sign. Bookmark the permalink. This was very cool, thanks! Thanks for the feedback, we’re pretty happy with how it turned out! Beautiful! We are a military family and I told my hubby that I’m gonna play that song for our kids in every one of their new houses as we move around. 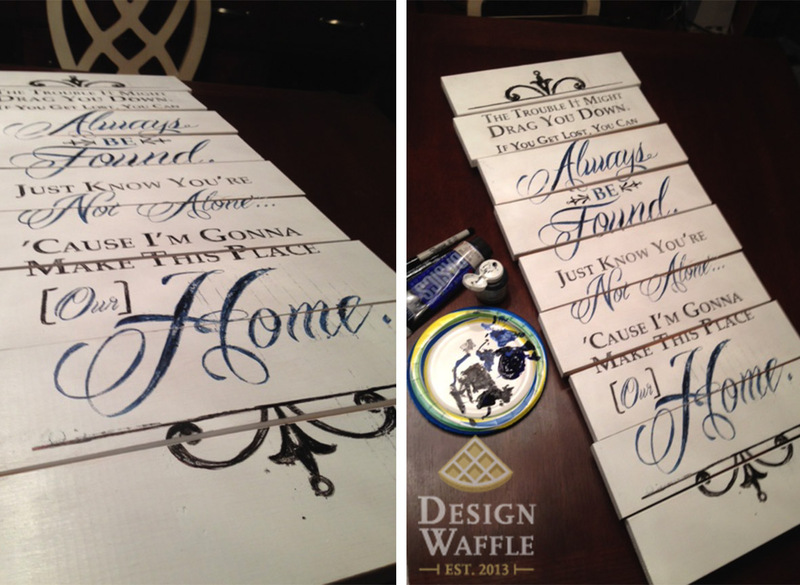 I hadn’t thought to make it artwork–what a great new home gift! 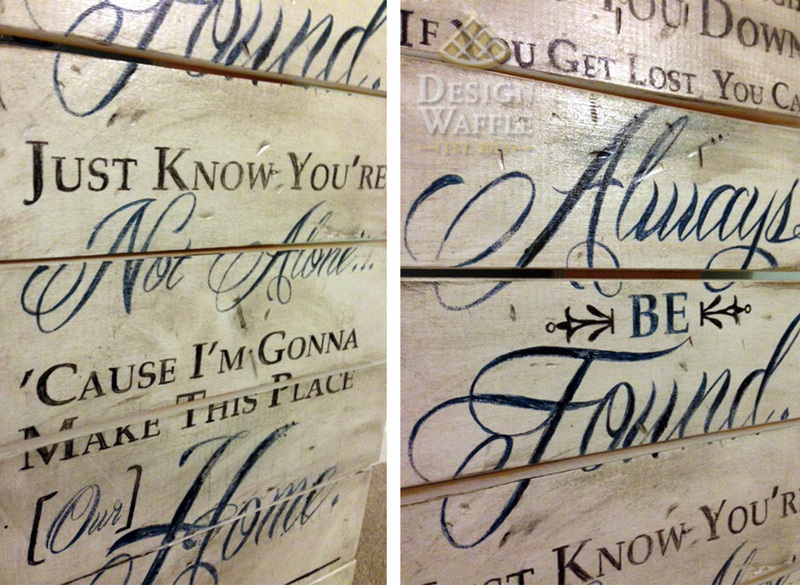 I never thought that printing on wood would be so interesting until I spotted this post. The message is nice and it seems like the type of project that you will surely enjoy doing. Gotta gather my tools to see if I can create one! This is so awesome! I’ve been chalk painting EVERYTHING and have seen some pieces with vintage french sings on them. Gonna try this this weekend! Please share a photo of how it turns out. I’d love to see it!